“MotorSolve continues to be the only choice for electric motor designers who want accurate and rapid simulations"
Easily explore the thermal effects and cooling considerations when designing an electric machine with MotorSolve v5.2. A new Duct Cooling feature allows for virtual prototyping of various approaches to cooling when a fluid is introduced into the machine within defined channels. The new release of the electric motor design software from Infolytica Corporation also includes improved induction machine analysis and support for exterior armatures in DCM templates. MotorSolve Thermal uses 3D FEA simulation which seamlessly work the software’s electromagnetic field computations (current, material properties) to predict the heating and cooling profile of brushless and induction machines. The proprietary algorithms developed by Infolytica Corporation allow for extremely accurate and rapid simulations. The new release adds Duct Cooling to the extensive list already available (Fan, Spray, and Contact). Duct Cooling parameters allow the user to configure the duct type (axial or spiral), apply the cooling to either the Housing or the Rotor, declare the number of channels, set the inlet temperature and flow rate, choose the empirical correlation factor (or allow for automatic selection) and assign a material to the intended cooling fluid (air, water, ethylene glycol, etc). Once all the cooling parameters are specified, the motor performance calculations that can be computed include amongst many: the temperature on each component of the motor, heat flux, losses and temperature field plots. All of this data can be used to predict the EM performance of the machine based on its running condition. 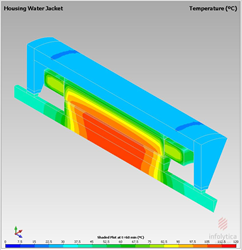 Explore the impact of adding a Housing Water Jacket on the cooling of a machine by configuring a few simple pull-downs. MotorSolve IM can now factor the impact of rotor and stator skew when performing the electromagnetic field computations for a better prediction of performance results such as cogging torque or torque-speed curve, for example. “MotorSolve continues to be the only choice for electric motor designers who want accurate and rapid FEA simulations, for both electromagnetic and thermal, in one software. No add-on tools and no exporting headaches. That’s why it remains one of our fastest growing products.” says Chad Ghalamzan, Marketing Manager at Infolytica Corporation. MotorSolve v5.2 is now available for Microsoft Windows 7, 8 or 10. For information about the full list of improvements, request a demo, quote or full feature evaluation, please contact an Infolytica Corporation representative nearest you. Infolytica Corporation has offered state-of-the-art design software for electromagnetic and electric field simulations since 1978. Engineers from a wide range of industries trust our software to understand and predict the performance of their device in applications such as electric machines, sensors and non-destructive testing (NDT), induction heating, MRI, shielding, power transformers and much more.